My family has been in the lawn care industry for a long time in Pinellas County. Over the past few years my father-in-law has slowly taught me the business. I have him to credit for teaching me how to do a good job, and how to take care of customers. Last season I took the leap of faith and got an edger, a 48” Gravely Zero Turn mower, a weed eater and blower and started my landscaping company in Pinellas Park with 5 yards. I'm an originally from Indiana, and being the fan of Hoosier basketball, I named my business Hoosier Lawn Care after them. I have been in the restaurant industry in St. Petersburg for the past several years, so over time I have built up a pretty good network all over the Pinellas area. When I started my landscaping company it worked out well because of I earned a lot of personal relationships over time here. My business has grown nicely over the past year through word of mouth growing from 30 yards to 70 regular lawn clients in St Peterburg Florida and I also go over and mow lawns in Brandon Florida as well.. This has afforded me the opportunity to transition out of the restaurant business and into the landscaping industry running my company full time. It feels really good to work for myself, and to be in control of my own destiny. I love the landscaping business and my customers all over St. Pete. I live in Pinellas Park, however, I service customers all over Pinellas County and St Petersburg, I am really focused on the towns of Largo, Seminole, Belleair Beach , Indian Rocks Beach, Indian Shores , Treasure Island, and St Pete Beach. I also have a cluster of lawns Gulfport, FL, and I’ll service up to Clearwater as far north as up to Gulf to Bay Blvd. I focus mainly on residential properties in St. Petersburg, however I do some commercial locations including one large shopping center in Tampa. I try to be the eyes and ears for my customers. When I am servicing their property I will take pictures of anything out of the ordinary and send it to them via email or text. Many properties I service are beach homes and second homes for my client, so they like the idea of me keeping an eye on their investment while they are not there. For example , one of my customers is currently traveling around the world in 80 days, and I was servicing his beach home in St Petersburg. I noticed that a large Verizon cable had come down on top of the house and I alerted him to it. I do my best to care for my clients’ properties as though they belonged to me or my family. While I like to focus on weekly lawn maintenance and mowing , every other week is a little slower on my routes’ workload, as some of my portfolio of business is bi-weekly. During that slower week I will take on landscape enhancement projects for customers around St Pete, such as shrub cleanups, landscape trimming, garden clean outs where I’ll pull out the weeds. Alot of times a one-time cleanup will turn into a monthly lawn maintenance client because they are so happy with the transformation in their curb appeal.. Recently, I have also been offering light tree work for smaller trees such as anything I can reach with my 6” ladder. I can perform regular trimming maintenance for palm trees, and also full removals for nuisance trees like a Brazilian Pepper tree, most folks want these unsightly trees removed. Outside of growing my landscaping company in St Petersburg, I really enjoy going camping with my kids . I just got a 8 person tent, and my family and I are doing a practice run setting it up in the back yard . My daughter and I have been having a blast camping in the back yard this past week as we are preparing for a camping trip with my church. We are going to Ft Wilderness in Disney with my church group. I attend church at Glad Tidings in St, Petersburg , we’re known as the Royal Rangers, and my brother in law is the youth minister there. I like it there there and funny thing is there are also a few other fellow landscapers that attend there as well. Building relationships with my customers in the most important thing to me, as my customers are also my friends. Thank you for reading about my company, and I hope to make friends with you as well..
You can say that Matt Dombrowksi has always been mowing lawns. At an early age, his grandfather made a special seat on his mower with a seatbelt so he could help his grandfather mow. 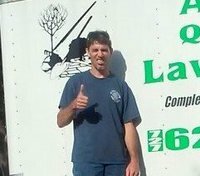 It’s a no brainer that Matt now owns one of the largest landscaping companies in the Fl area. What started with just a push mower and a part time gig, Matt had to quit his job with the City of Clearwater to service his clientele. The Clearwater native has built his business up to over 200 residential homeowners and numerous commercial accounts. Him and his crew now have 4 trucks and service the Dunedin, Clearwater, Clearwater Beach, Palm Harbor, and the Largo areas. Not only will Matt and his team at the Ground Guys handle your regular lawn maintenance needs but they will also handle your irrigation, landscape install & removals, hardscapes, outdoor kitchens, pressure washing, low level tree trimming, mulching, sodding, gravel and rock work, pavers, and even your full scale landscape design. When asked what was the secret to his rapid growth, Matt automatically replied "We are all about quality. Plain and Simple." Matt went on to add, "We also develop relationships with all of our customers and when they call, we are there to pick up the phone and talk," Dombrowski explains. "We are proactive on our communication with our customers and we will always hit our dates." Matt explained that his love for mowing started at an early age with his grandfather and has always been obsessed with this industry. "I have always had a love for the outdoors, learning about the landscaping industry, and especially love seeing a beautiful finished project," Matt says. "Seeing a customer satisfied and happy is worth way more than any paycheck I get." 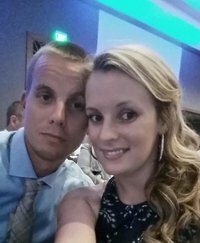 When Matt is not out running his business, he loves spending time with his wife, Caprice who also serves as the office manager for the Ground Guys and the Dombrowski house manager. They also have two beautiful kids. You can also find Matt hunting in North Florida or fishing in the Gulf and soon you may find him scuba diving as he wants to pick up spear fishing as a hobby. Whether your lawn needs a little more attention to detail or a full on re-design, let Matt and his team at the Ground Guys of Clearwater make your neighbors jealous. Ive been in business for 5 years and in the bussiness for 10 as a former major league baseball grounds keeper I have a true love for turf and landscaping maintenance it's not just a job it's a hobby How does your work stand out from other lawn service companies in the area? Or work stands out, because we care all technicians are properly trained certified , and must have a love for there job. We maintain a high quality of work. Our most important value that sets us apart is are attention to detail even the most minor ones. What do you like most about the lawn care industry? The ability to transform someone's landscape and enhance there property as well as benefit the environment all at once , and then being able to sit back and look at the end results. What areas do you mainly service? We provide landscape maintenance in Palm Harbor and also cut grass in Lakeland Florida with our sister franchise. Dunedin, clearwater, palm harbor , largo, the beach's. AIG Lawn and Landscape has been a fixture in Tarpon Springs for over 15 years. Rick Muller ventured out on his own after working for another landscaping company in the fall of 2001 and never looked back. His one man crew turned into 2 full time crews and has amassed numerous residential customers and also has various commercial properties including multiple HOA's, malls, and a retirement community. The Northwest Tampa native was born and raised in Odessa, Florida but now calls Tarpon Springs home. "I love the area and I love working with our community," Muller exclaimed. When asked what has led to his companies phenomenal growth, Rick immediately said "clear communication." He goes on to explain, "We have clear lines of communication with all of our customers and we will set up monthly emails, texts, or face-to-face meetings to make sure that everyone is happy. This clear communication has led to our company growing by word of mouth and very little advertising." Not only is AIG your full service lawn and landscaping company but they are fully licensed for pesticide and fertilizer treatment. "We will do everything from leaf removal, mulch, rock removal, shrub and bush pruning," Muller says. "No job is too big or too small for us." Rick and his crews service the Tampa Bay area including Trinity, Holiday, Odessa, Tarpon, Offering lawn care service in Palm Harbor, Dunedin, Countryside, Oldsmar, & Saftey Harbor. I also know of other lawn care services in Brandon Fl if you need a good referral for that area. His love for the outdoors and working with his hands is so strong that he turned down multiple lucrative opportunities to keep doing what he loved. "It was a no-brainer, I don’t want to be in an office all day," Rick laughs. "My landscape literally changes every day!" When he is not running his lawn empire, you can find Rick at the baseball fields. He coaches both of his twin daughters and his son and calls the fields his second home. Needless to say, Rick and his wife are pulling double duty on and off the field. Whether your lawn is needing a full blown makeover or just some regular lawn maintenance, let the pros at AIG get you squared away. I grew up in St Petersburg Florida and have spent my entire life here. 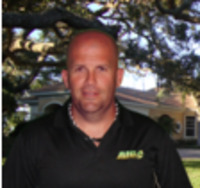 I attended high school at Gibbs High School in Pinellas County, and I have been in the landscaping industry for over 20 years here in St Petersburg. My inspiration to start my lawn care company came from my mentor who was a customer of mine at the Auto Parts distributor I worked for previously. I observed him as he grew his lawn care business, we became friends, and so I also worked from him part time initially. I got my start running my own lawn care business one day when he asked me if I wanted to take 20 single family residence customers off his hands, because at that point he had grown his lawn maintenance business servicing large accounts such as shopping centers. So I took the leap of faith and I started out with those 20 lawns At the time I was working for AutoWay, I worked there for about 15 years, and and with my accumulated month's worth of vacation, I started out mowing those 20 lawns and I never looked back. I'm glad I did, I really enjoy working for myself in the lawn care industry. I offer lawn mowing service in St Petersburg Over the years I have grown my service area to all of St Petersburg, including the areas of Pinellas Park, Largo, Clearwater, Treasure island , Gulfport. and Seminole. I will serivce lawns as far north as the Skyway Bridge and Gulf to Bay Blvd . If you need lawn care in Lakeland Florida, I know a great lawn mowing service over there also. I have been able to grow my business to 50 ongoing lawn care customers. For most of my lawn care service customers, I will do the mowing , trimming of the bushes., and keeping the weeds out of the mulch beds. If a customer comes to me with a need that we do not offer, such as tree work, I will do my best to refer a local reputable business in St Petersburg for them. For example, for tree work I will refer tree work to my friend Lee with Sparky's tree removal. He is local, honest, and does good work, just like me. In addition to weekly mowing, I offer full service landscaping, such as plant replacement. we also offer red mulch and brown mulch installation. Recently we did an installation of Shale Rock for a customer in Treasure Island, and it turned out real nice, I was proud of that job. For several of my customers I am serving their second homes, and beach homes. They are usually away from half of the year, and I am happily their eyes and ears while they are away, looking out for their biggest investment. Some things we do differently than the other guys mowing lawns in St Petersburg, first off, we show up every week, year round. So on my route I still go by each home every week even during the winter, so we can blow them off, and rake up leaves, and keep the property in tip top shape. I learned that from my mentor, the little things add up to big things. I have found that when my customers see me every week and that's what separates me from the ton of other guys mowing lawns around St Pete.. The other thing is that we are trained and certified in Landscape Best Management Practices by Pinellas County, my license number is 5634, so rest assured, you're in good hands with Andy’s lawn care here in St Petersburg, Florida. I have been in business for over 20 years, serving Pinellas County. I am licensed and insured. Specializing in regular monthly maintenance, residential and commercial and clean-outs Service Days are Monday-Friday CLOSED: Saturday & Sunday. 20 yeas in business love doing lawns. How does your work stand out from other lawn service companies in the area? We are reliable and dependable and treat all of our lawns with care. What do you like most about the lawn care industry? Making the lawn look beautiful every week and throughout the year What areas do you mainly service? St. Pete, Pinellas Park, Gulfport, Seminole, Largo, and Beaches. Service days are Monday - Friday. Closed Saturday and Sunday. “There are tons and tons of lawn mowing services throughout St. Petersburg, FL however I have found that many of them will not travel to my home in Safety Harbor Florida I would have to beg and plead for them to come cut my grass every week on the lawn mowing day that I wanted but a friend from church told me about GreenPal expanding their online lawn care service to Safety Harbor so I thought OK I'll just give this a try and sure enough the lawn care service that they introduced me to in Safety Harbor Florida comes and cuts my grass each week like clockwork and I only get billed per yard cut and I know that I am back by I lawn care guarantee that's what I like about it the most." Hello and welcome to the GreenPal online ordering page for lawnmowing in Clearwater Florida. I'm glad you stopped by and if you were needing lawn care service in Clearwater are including Safety Harbor, Dunedin and Belleair Florida you have arrived at the right place. My name is Gary and it's my job to be your lawn care concierge helping you find the best for lawn mowing service in all of the Clearwater area nearby you to help cut your grass for you. I have done the hard work for you, I have met with almost every lawn care service in Clearwater Florida, interviewed them, looked over there lawn mower equipment, and even observed them cutting a few yards in Clearwater. Why did I do this? So I could help find the top 10 best lawn care services in Clearwater and enable you to order lawn mowing from them directly from this webpage or from the GreenPal mobile app. The good news? Your search for a lawn care service in Clearwater Florida is over. Also.. many of GreenPal's users get their vacation home in Clearwater mowed with GreenPal but also use GreenPal for lawn mowing in Lakeland Fl, and yard cutting in Brandon Fl for their rental properties for primary residence. I have been up and down Court street and Sunset Point Road a thousand times and I've seen the inside of every lawn mower shop in Clearwater, Dunedin and Safety Harbor Florida to find the best lawn care services to cut your grass for you. Clearwater is booming with a recent services the population is over 109,,000 people and although you may see lawn care services riding up and down Highland Ave every day the fact is most of them are busy and are not accepting new customers. That's where GreenPal solves that problem for you because we find the best lawn care services that really want your business. Many are part-timers that cut grass on the nights and weekends , some are fireman for the city of Clearwater, FL and others are school teachers in the Pinellas County school system. What we have found is the smaller lawn care services and yard mowing businesses are the best ones because then your yard is getting cut by the owner who mows and manicures your lawn versus some big company with employees that I do not care about the quality of your yard mowing. The problem has always been that the smaller lawn care businesses in Clearwater do not have an office or secretary to answer your phone call so getting them on the phone to come give you a lawn mowing quote or price can be tough. Well GreenPal has eliminated that problem because now you can get 3 to 5 free lawn mowing quotes in 15 minutes from different lawnmowing services in the Clearwater FL area nearby you just click get my free bids and you will receive multiple free yard cutting quotes from local Clearwater, Dunedin and Safety Harbor lawn mowing services that want to come cut your grass today or tomorrow. Then after they do a good job cutting the yard you can then hire them for the entire lawn care season on the GreenPal app and the best part you never have to leave a check for the lawn cutting because payment is all handled seamlessly inside the mobile app and website. Don't you love how technology makes our life a little bit easier now even lawn cutting is as easy as getting in a Uber. Clearwater is a city in Florida's Tampa Bay area known for sunny weather and gulf coast beaches. The area's population grew after the Federal Armed Occupation Act of 1842 offered 160 acres to anyone who would bear arms and cultivate the land. Early settlers included the Stevens, Stevenson, Sever and McMullen families, who claimed and farmed large tracts of land. Prior to 1906, the area was known as Clear Water Harbor. The name "Clear Water" is thought to have come from a fresh water spring flowing from near where the City Hall building is located today. There were many other freshwater springs that dotted the bluff, many in the bay or harbor itself. On corner lot, no backyard. Side yards and front only. My lawn is mostly weeds. I don’t gave a fence or any animals outside. I am currently unable to mow due to a recent surgery.